Senior defenseman Mike Crocock, a Sacred Heart men’s hockey co-captain this year, had three points in the Pioneers’ playoff-series win over RIT in March. BRIDGEPORT — From New Year’s on, Sacred Heart men’s hockey was just about a .500 team and improving. The Pioneers won their first playoff series in Atlantic Hockey in three years in March. With a lot of key contributors returning, that finish could be a double-edged sword. The Pioneers will have three chances to measure up against top programs over the first two weekends of the season at Webster Bank Arena. Then comes the Atlantic Hockey season, beginning at Bentley on Nov. 2. The optimism comes in part from what Marottolo called a balanced roster, with a big group of talented young players, nine sophomores who played some key roles last year and another seven freshmen, including Colin Bernard of Stamford. WHEN: Friday, Saturday, 7:05 p.m.
YOU MAY KNOW: Huskies Soph. D Billy Carrabino of New Canaan played 13 games last year. WHEN: Saturday, Oct. 20, 7:05 p.m.
YOU MAY KNOW: Friars Soph. F John McDermott of Darien transferred from Boston University. Fr. F Tyce Thompson is the younger son of Bridgeport Sound Tigers coach Brent Thompson. “We all went home this summer and worked hard,” said sophomore forward Marc Johnstone, an alternate captain, whose 30 points last season put him among the NCAA’s top-scoring freshmen. “We’re still underclassmen, but we’ve got to carry some responsibility for the offense and play some big minutes in the back. The seniors include goalie Brett Magnus and Hamden’s Mike Lee, a defenseman who transferred from the University of Vermont but had to sit out last season. No. 15 Northeastern comes in Friday and Saturday nights. Providence, No. 4 in one poll and one spot lower in the other, plays in Bridgeport on Oct. 20. 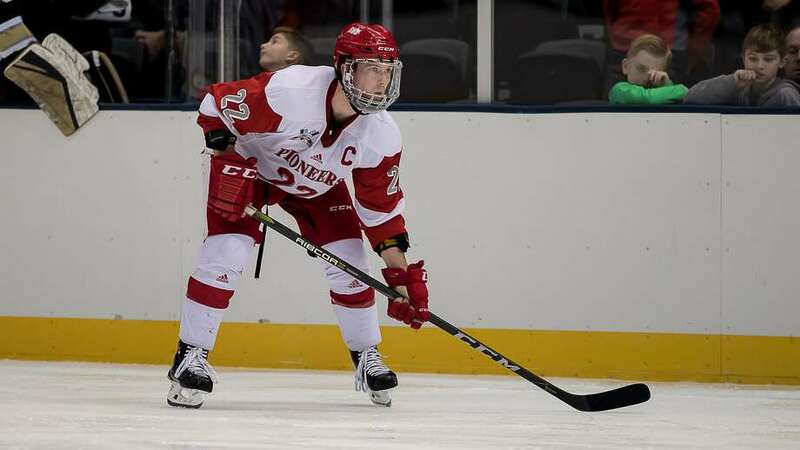 The Pioneers have thrown in some standout wins against top teams in recent years, like when they played opening-night spoiler to top-ranked UMass Lowell in 2013, or last year’s 6-4 win at No. 5 Notre Dame.